Like other integrations, you need to be an admin in order to enable the Zapier integration. 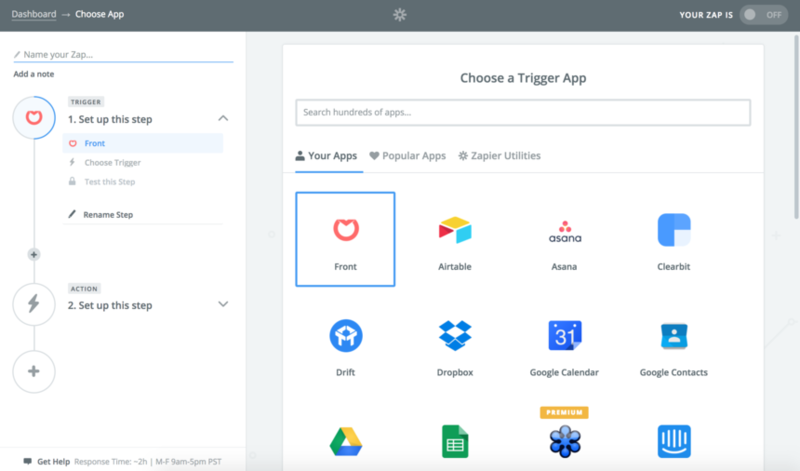 The Zapier integration allows you to automate your workflow by connecting Front with hundreds of other apps. Build Zaps that dynamically trigger when something happens in Front or that take action in Front based on events in other apps. Go into your Settings and select Integrations. Click Zapier, and Enable integration. Click Save to finish enabling the Zapier integration. You will need to complete this step before building your first Front Zap, otherwise you will encounter an error in Zapier. Start making Zaps! Log in to your Zapier account, and click on the "Make a Zap!" button. Choose Front as Trigger or Action app from the app chooser, along with your other desired apps. The possible Front Triggers are outlined in red below. When a Trigger is activated by any app, a number of Actions can occur. Front Actions are outlined in red below. Upon activation of your Front-triggered Zap, a rule is automatically created in Front. You can view the rule by going into your Settings and selecting Rules. When you disable or delete a Front Zap, the related rule will be deleted. 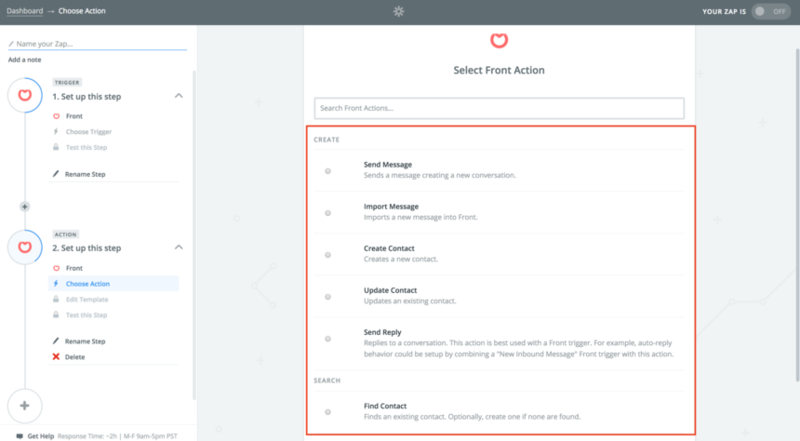 Front's Zapier integration is available to users on our Premium or Enterprise Plans. If you're currently on a Basic plan, you'll see the following notice in your integration settings and will need to upgrade. If you're not on an eligible Front plan, you will see an error in Zapier that says "Your plan does not include API access" when you try to connect to your Front account. Once you're on an eligible plan, you will need to enable the Zapier integration in Front (following the instructions above) before you can start building Front Zaps. If you seeing an error that says "Zapier integration is not enabled," then go into your Front integration settings and enable the integration. Front doesn't pull in individual inboxes. The Zapier OAuth token is only allowed to access shared inboxes. When catching the webhook i only get "Message blurb" or "Message summary" and these two cuts the message after 200 chars. Is there a way to get the whole text message? Or is there any other way to get the whole text message into zapier? 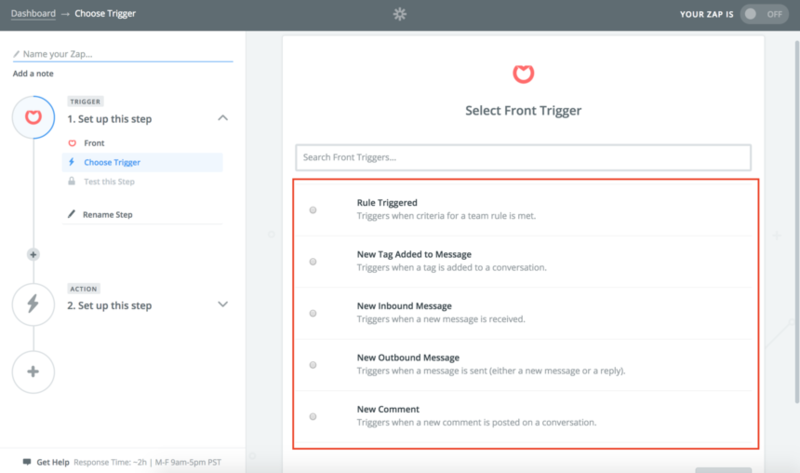 By using the Zapier built-in triggers, the full message content is available in the fetched variables. Is Zapier integration available on Basic plan? Svetlana Malakhova Yes, but because it requires API access, you will need to email us in order to get it turned on. Do contact custom fields come through to zapier also when for example using the search & add contact endpoint?